As the war drags on in the Desert on the afternoon of 10th May a disillusioned Deputy Fuhrer Rudolf Hess said goodbye to his wife and young son saying he would be back by Monday evening. From Munich he travelled in his Mercedes to the Messerschmitt works in Augsburg, Bavaria. There, he changed into a fur-lined flying suit and Luftwaffe captain’s jacket – his alias on his mission was to be Hauptmann Alfred Horn. His plan was to take an Me110D on the pretext of a training flight and fly across the channel to Scotland to contact Douglas, Duke of Hamilton, a noted Nazi sympathiser, who he has been corresponding with and who he believes will help him broker an end to the war between Germany and Great Britain. 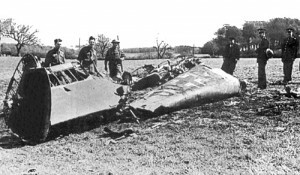 Pursuing German fighters, alerted by Hess’ deviation from the filed flight plan, are thwarted by scrambled Hurricanes air defence but Hess, failing to find his planned landing site, was seen to bale out and the plane crash lands in a ball of flames at Floor Farm in Scotland. Meanwhile in Germany the news struck the Berghof like a bombshell. Hitler is furious with Goering for allowing Hess to escape, especially as the invasion of Russia is just six weeks away. Goering promises to have Hess returned to Germany or shot within 48 hours. Calling on his own fallschirmjager he orders an immediate mission be mounted to parachute men into Scotland. Himmler, in a side swipe at his rival, suggests to Hitler that as it is a Party Issue , members of the fledgling SS Paratroop Regiment should accompany the FJ, to “ensure the mission is carried out to the true spirit of National Socialism”. To this end some 20 men are hastily briefed and then bundled into a Ju52 at Hamburg to set off over the North Sea. Promises of a pick up by U boat are treated with derision, no man among them is under the belief that this is anything but a one way mission. This all day event will cost £45 and booking for 40 players opens on 1st January 2011. Please see forum for more details.